Love is not an easy thing to measure - as Little Nutbrown Hare and Big Nutbrown Hare Discover! This 3 CD Set music collection is inspired by the best selling book. 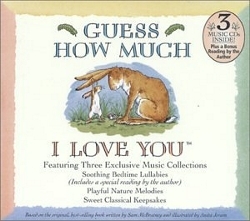 "Guess How Much I Love You" is a love story - a tale of the reassuring bond of love between a parent and a child, written by Sam Mcbratney and illustrated by anita Jeram. Each CD within this collection has a theme that echoes the sentiment found in this charming story. One of our all-time best sellers - this Original Baby Genius release is sure to be one of the best additions to your and your child's music collection. My son is 14 months old and loves it - especially the first cd. It is relaxing and soothing. The words to the songs are beautiful. It works like a charm to get my son calm and to sleep peacefully. It is a perfect gift for a new family or baby shower. We absolutely love this box set. My husband bought it when we were expecting. I love the book "Guess How Much I Love You" and we listened to the cd both while my baby was in utero and also in the hospital after delivery.